This class is completed conveniently from your home online. Students are only required to attend five class days at our facility and come in for a sixth day to take their national test. Graduates of our Billing and Coding program can find careers in a variety of medical settings from hospitals, doctor’s offices, dental offices, nursing facilities, insurance companies and there are even jobs working out of your home! If Billing and Coding interests you, contact EMTP today at 859-327-3687 to start working towards your career! How do I become a Certified Billing and Coding Specialist? 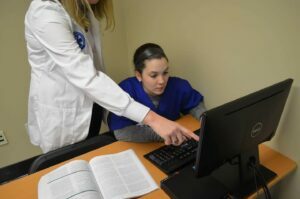 Upon successful completion of the Billing and Coding Program and the clinical requirements, each student will receive a course completion certificate and will be eligible to sit for the NHA Certified Billing and Coding National exam. You will also be given the opportunity to sit for additional credentialed exams such as the Certified Coding Professional Physician & Hospital (CCP-PH) and the Certified Medical Billing and Coding Professional (CMBCP). Complete this Program online in as little as 6 months.